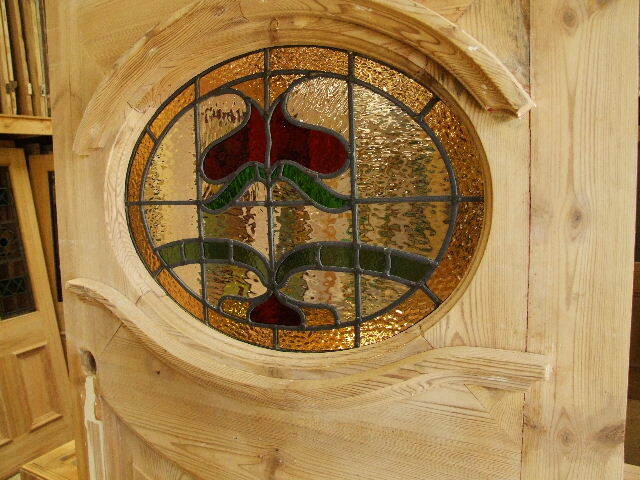 Reclaimed art nouveau 1930,s Front Door with stained glass panel. Here we have a pretty 1930,s front door with an oval stained glass panel. There are two long solid panels below. There was a vertical letterplate fitted to the left hand siderail this has been infilled with timber. The stained glass has been made with antique reclaimed glass and using traditional methods. the dimensions are : width 31 5/8 x 79 1/2 1 3/4 inches. Click here to view our oak and hardwood 1930,s stained glass front doors.